Oh boy have we been bitten by the Olympic bug! We have been having so much fun doing simple Olympic themed activities this week as part of our A Very Toddler Olympics series. We love finding simple activities that are quick to prepare. Yesterday we shared pool noodle hockey and Jenae shared a Olympic rings bracelet made out of straw. 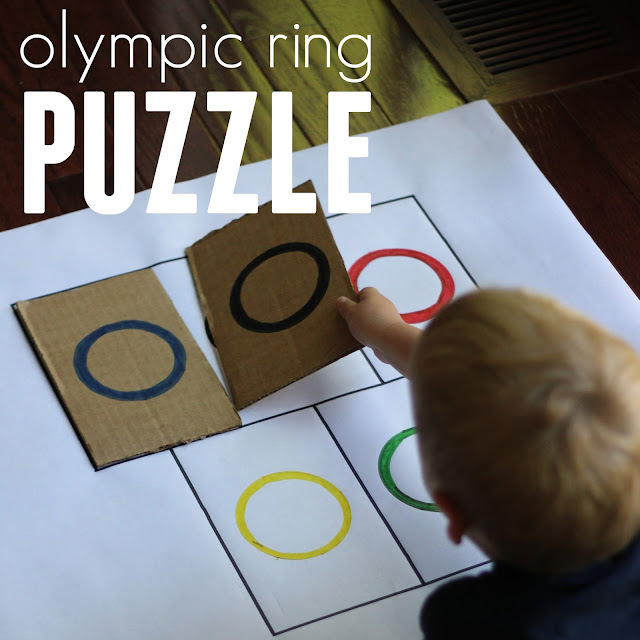 Today we are sharing an easy cardboard olympic ring puzzle. This puzzle helps kids practice matching colors and is the perfect size for little hands. To get started you want to cut out 5 squares or rectangles out of cardboard. Make sure that each piece of cardboard is the same size. 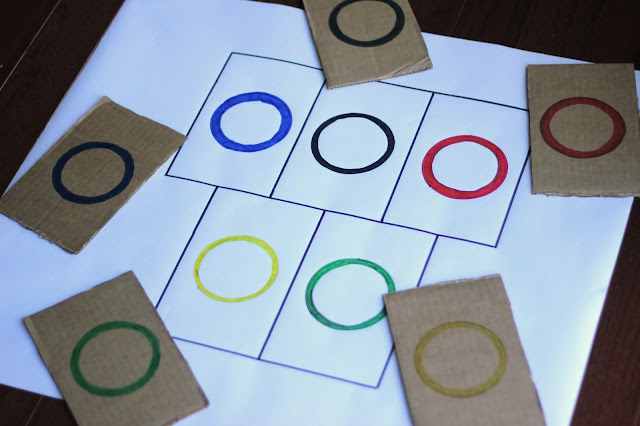 Next, use the Sharpies and a cup to draw a colored circle onto each piece of cardboard. Next outline the squares/rectangles with a black sharpie and draw circles onto the easel paper. Make sure you put the rings on the big paper in Olympic ring order. Once you have colored rings on your cardboard and colored rings on your white paper then you are ready to play with the puzzle!! My kids had fun taking turns matching the cardboard rings onto the white paper rings. We talked about the different colors as well. Matching is such a great way to work on visual discrimination with kids. 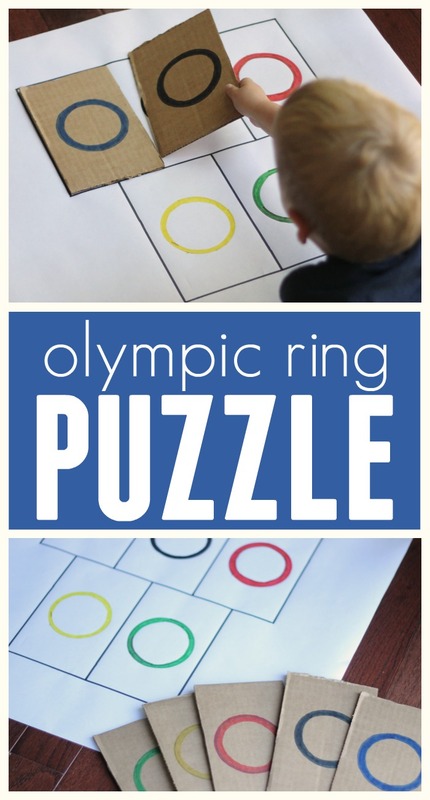 If you want to be a little fancier you could even try making a felt Olympic rings puzzle. It is a little bit more durable. This simple Olympic ring puzzle is great for little ones because the cardboard is easy to grip and move around. To make this puzzle a little bit harder you could draw the rings intertwined on a big piece of cardboard and then cut them out. I loved watching how the kids worked together to make this puzzle! Do you plan to watch the Olympics? Make sure you head over to I Can Teach my Child to check out Jenae's Olympic Clothespin Relay.